"Aw baby, don't go yet, it's only a quarter to twelve." Joe did NOT miss class this week. He and Eric have returned from a successful European tour, and Joe got back to work teaching the Little Walter slow blues tune, Quarter To Twelve. Joe pointed out that Walter often plays with a double-time feel over this slow groove. Other unique things to watch for are Walter's jazzy use of headshakes on holes 5 and 6 and his rapid, almost imperceptible "partial" headshake, which Joe notates with a "$". View transcription. We continue to rehearse Shoji's four-part arrangement for Silver Bells. This is ensemble playing that everyone should get involved in and play with us at the December 11 Recital. Pick a part you feel you can master and work on it so you have it memorized for the December 11 performance. We will work on this at 8pm every week leading up to the recital. Regardless of the part you choose, Shoji recommends everyone also spend some time learning the melody (Part One). Here's the link to Silver Bells. Special Guest - Son of Dave! B1 had a surprise visit from Son of Dave last night. 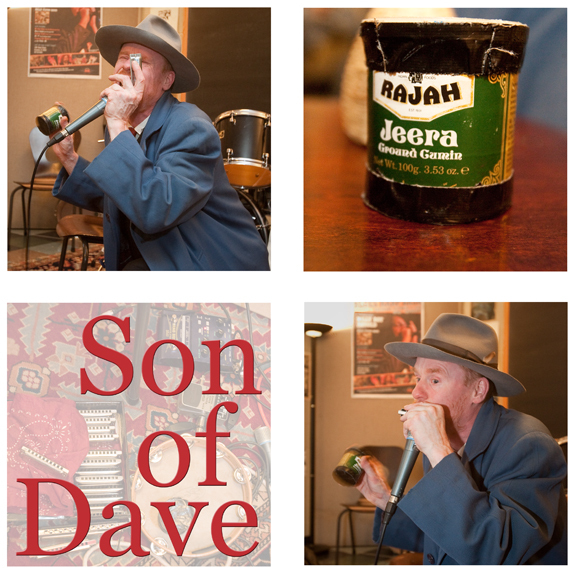 In Chicago recording his next album, Son of Dave stopped by to give us a taste of his high-energy, whirlwind, one-man-band style of blues-infused music. He plays strong, infectious harp grooves, stomps his feet, rattles shakers, moans, groans, screams and beat-boxes to create a wild, layered one-man show. To see for yourself, check out his videos at: Son of Dave. Buy his discs here. Hot New YouMissedMonday Blog Feature! We've added a new, separate calendar to the ymm blog. This one features blues jams so get out there and sit in to improve your playing! If you're hosting a jam, be sure to let us know so we can list it for you. "Compared to other blues marker ceremonies I've attended, this one was pretty modest. It was held on a weekday, so the crowd wasn't very large. Mostly local New Albany dignitaries, a few of the honorees' relatives, and several members of Rev. Pinson's church. 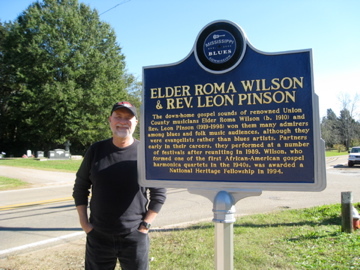 The marker was placed across the road from Rev. Pinson's old church and there was a nice reception in the church hall afterwards with some terrific gospel singing. I had hoped to be able to talk with some of Roma Wilson's children, but none were there. I did speak with Sam Mosley, a local bluesman who has also been honored with a Blues Trail Marker. He said that he grew up listening to Elder Roma Wilson and enjoyed his playing but didn't, at the time, appreciate its significance. He thought that most of Wilson's children are still in Detroit where he lived for several years. None returned to Mississippi with him." To read more about the Blues Trail, click here. Joe will pass out Recital sign-up sheets next week and they will be due back the following week. Be putting together your song list for tunes you plan to play at the Recital on December 11 -- your talking blues song is highly encouraged at the Recital. Harmonica Einstein is looking for an agent.